The hilarious, classic memoir of the international tennis circuit.”A Handful of Summers” is a delightfully uninhibited insider’s account of tennis on the international circuit in the fifties and sixties — both on and off court — in the glory days of Fred Perry, Roy Emerson, and Virginia Wade.Forbes begins with his childhood on a farm in South Africa, where he learned to play tennis on a gravel court. His game takes him to Europe, as a South African Davis Cup player, and finally to Wimbledon. Along the way he cavorts with extraordinary characters among the world-class players, including a young Billy Jean King and Rod Laver — and their tales, and his, shine throughout this irresistibly witty memoir. A cult classic among tennis aficionados when it was first published in the United States, it is a current bestseller in South Africa. 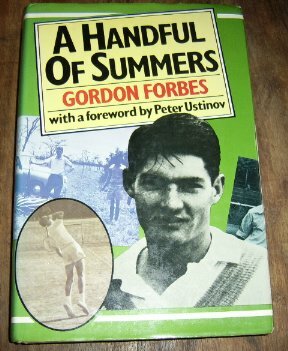 This entry was posted in Lit and tagged Books, Gordon Forbes, South Africa, Tennis by Sir Edward Percival Fox-Ingleby, Bt. Bookmark the permalink.